Beth Landrum is the Senior Accounting Manager at Homestead Independence Inc., a $7 million dollar durable medical products company based in Cudahy, Wisconsin. Beth is no stranger to the challenges that face most internal accounting departments that must navigate the wild and wooly world of small business accounting. 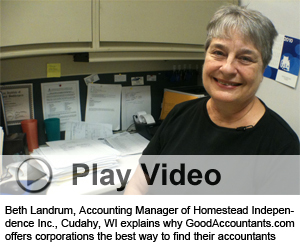 Joining Homestead Independence after years of working for various accounting firms, Landrum had become deeply frustrated with the lack of QuickBooks competency of the accounting firm her employer had been using. After looking at several local accounting firms Beth decided to turn to the Internet where she would quickly become aware of GoodAccountants.com, the nation’s largest accountancy referral service. Quickly filling out a short online form through which she submitted information about her company Landrum then received a phone call that would completely change the direction of her search. For many small to midsize companies the path to finding the right accounting relationship is one fraught with twists and turns which can often require the assistance of a professional research consultant. The end results of engaging the wrong accounting firm can become years spent having to undo the damage done to a company’s internal accounting process; the reason many accounting managers and chief financial officers are no longer willing to go the process alone. “We wanted a proactive CPA, a QuickBooks professional that knew more about QuickBooks than we did,” says Landrum. “When we talked with Patty Schoenfeld at GoodAccountants.com she asked me what we were looking for in a new CPA firm which was very different from what we had,” adds Landrum. “Patty listened and was able to hear what our needs were and that was perhaps the best thing about GoodAccountants.com,” explains Landrum. “Patty heard me when I said I needed someone that was going to be proactive and she understood what that meant in the context of our industry and she successfully conveyed that to the CPA firms that we were talking to,” says Landrum. “Patty heard me and that was extremely beneficial to us,” she adds. In the past when companies decided to change accounting firms they would consult their banker or attorney however today they turn to the Internet and to professional consulting firms with whom they feel more comfortable discussing the pros and cons of firms that may become possible candidates. “Years ago when we would call up an accountant on the telephone and attempt to explain that we had been retained by a local company to find an accounting firm for them the very first thing the accountant would ask us was ‘who are you and why do they need you’ to find an accountant for them,” says Johanna Laurent, President of GoodAccountants.com. “We don’t get those kinds of questions from accountants anymore,” says Laurent. Although GoodAccountants.com is a recognizable brand throughout the accounting industry the fact is accountants are beginning to understand that many companies prefer having a consultant that can do the preliminary research and then connect them with only qualified candidates that can fulfill their accounting needs. For the company the process becomes one that is less time consuming and more productive. For the accountants it becomes one that affords them better preparation before meeting the prospective client. “Our clients often share their inner most thoughts about what it is they are truly looking for in their accountant which is something they would never share directly with the accountant or the accounting firm,” says senior GoodAccountants.com consultant Patty Schoenfeld. “We function very much like a dating service in that we look at more than just accounting needs when we put a client together with one of our accountants; we also look at compatibility among other things,” adds Schoenfeld. To see the full reality television episode filmed on location in Cudahy, Wisconsin featuring this company and the accounting firm referred to them by GoodAccountants.com please click here. To learn more about Goldberg Mechales Charneske & Schiffman, Ltd, Certified Public Accountants please click here.